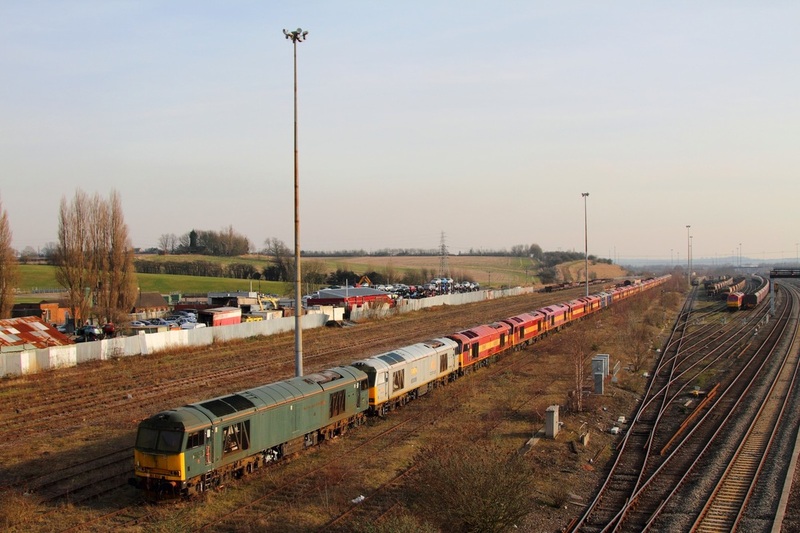 DB Schenker's 60081 in the famous but now faded GWR green livery leads a line of redundant class '60s' in Toton yard on the 28th February 2013. 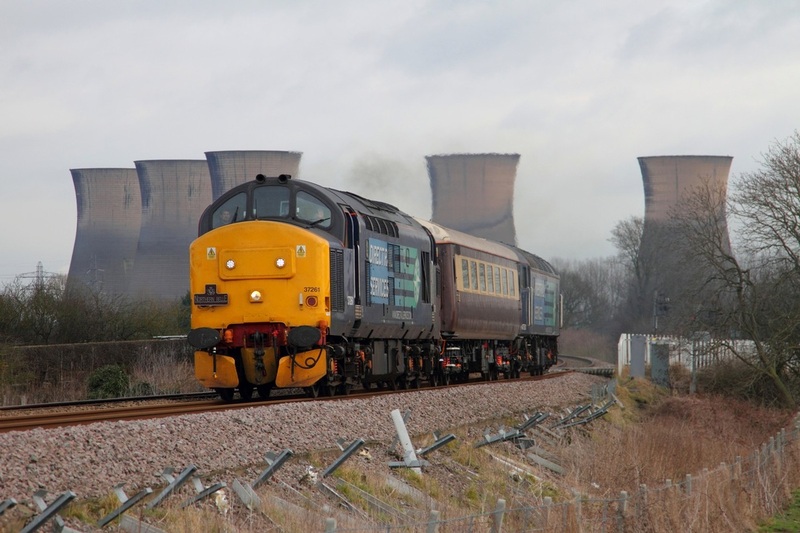 This shot is from the A52 road bridge into Nottingham. 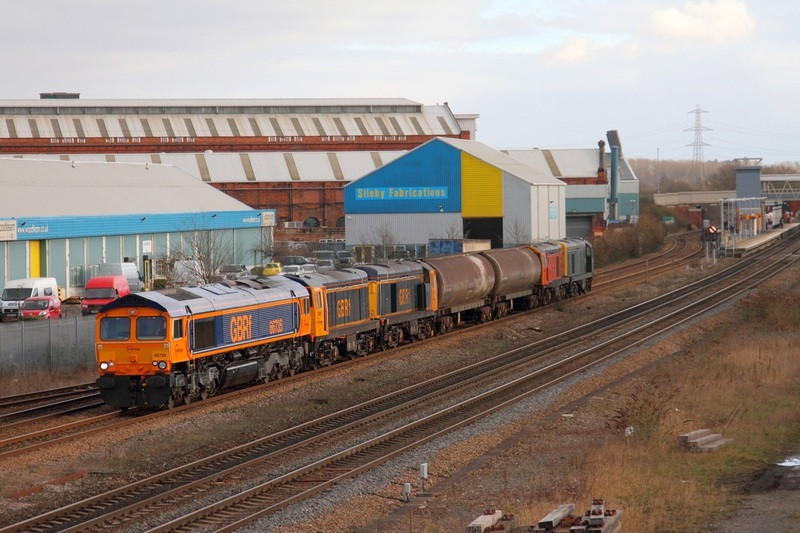 Notice 60017 in the yard running around its coal train whilst working from Ratcliffe to Liverpool as 6F18. 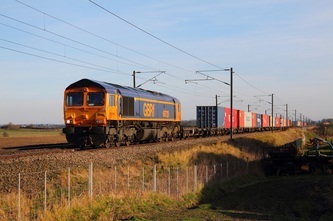 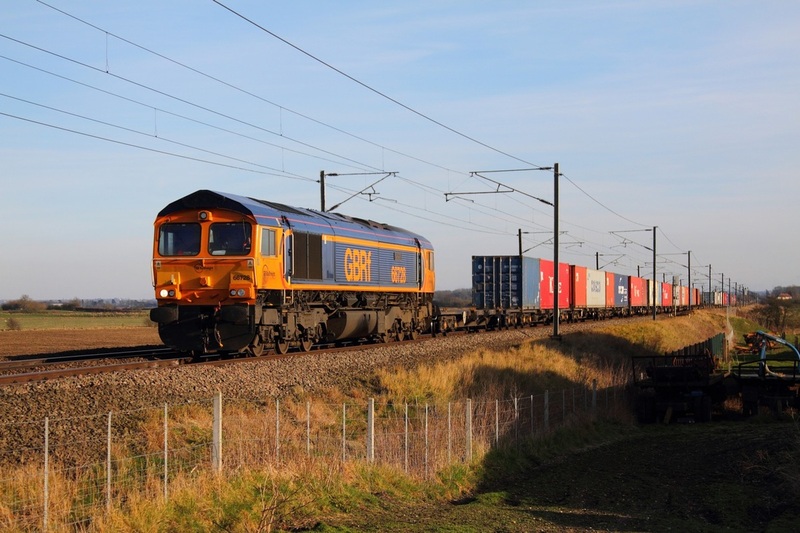 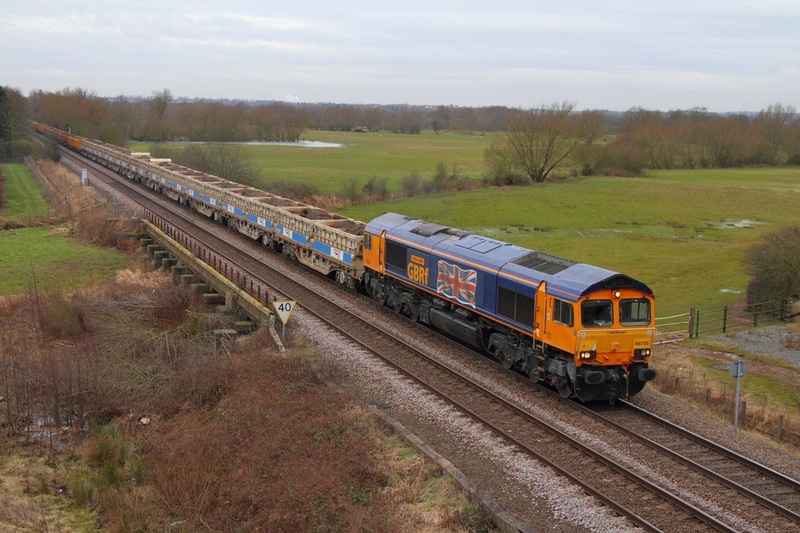 With Kirby Bellars occupying the background, GBRf Union Jack liveried 66705 approaches Melton Mowbray with the slightly re-timed (after departing 68 minutes late) 6L76 Stud Farm to Whitemoor loaded stone engineering train on the 28th February 2013. 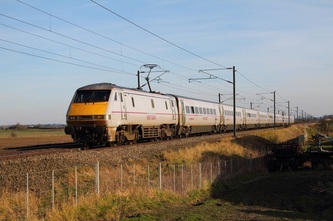 East Coast's Skyfall liveried set with 91007 (91107) in charge, powers through Broad Fen Lane, Claypole whilst working the 1D18 14:35 London Kings Cross to Leeds East coast service on the 27th February 2013. 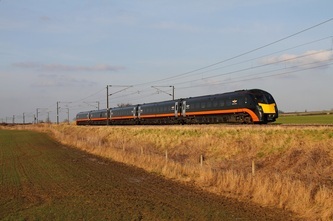 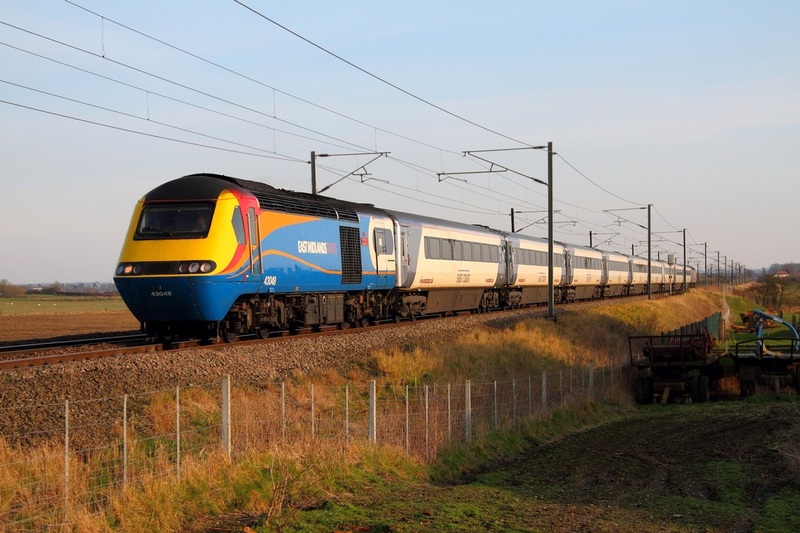 East Midlands trains 43048 on hire to East Coast is captured here at Claypole leading the 1S16 London Kings Cross to Edinburgh with 43306 on the rear on the 17th February 2013. Flying Scotsman liveried 91101 leading the 1S18 Kings Cross to Edinburgh at Claypole on the 17th February 2013. 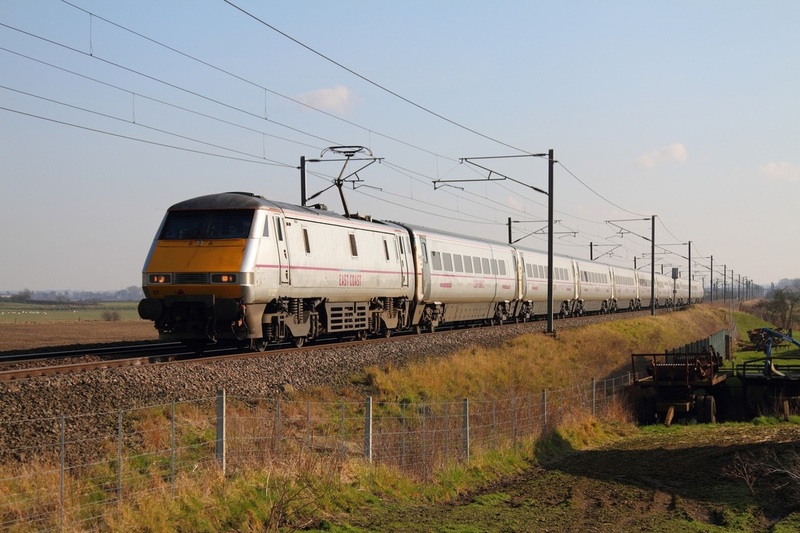 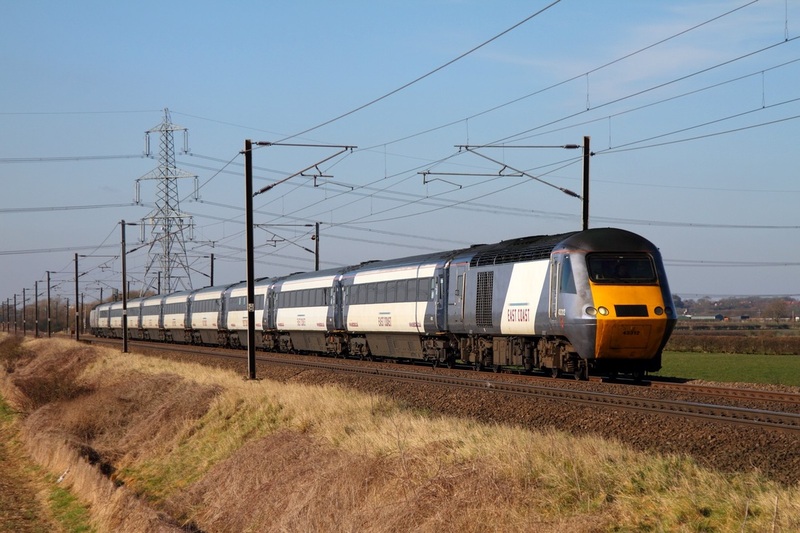 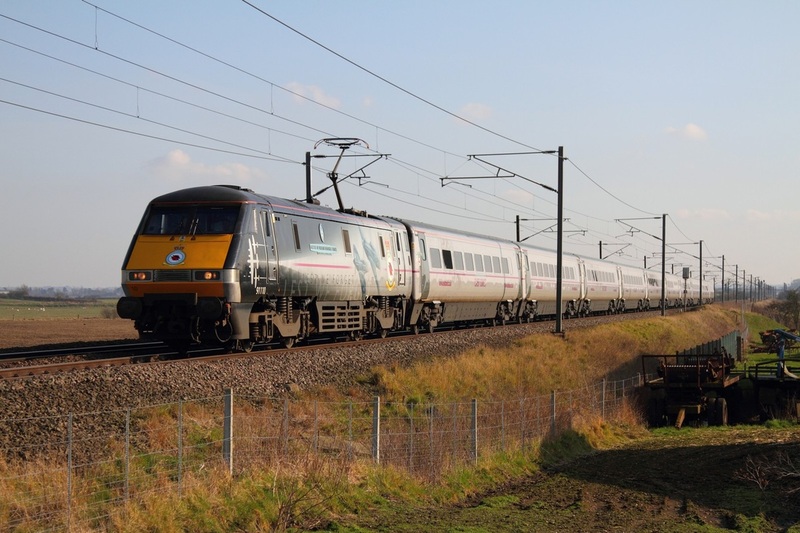 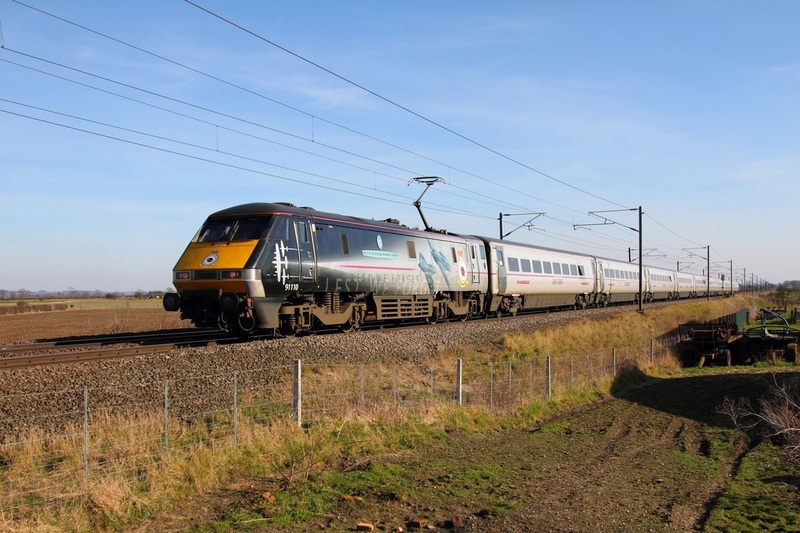 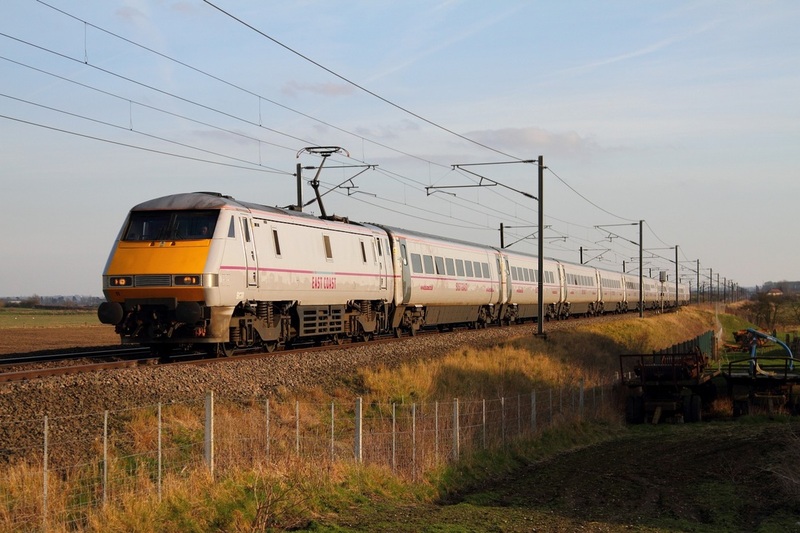 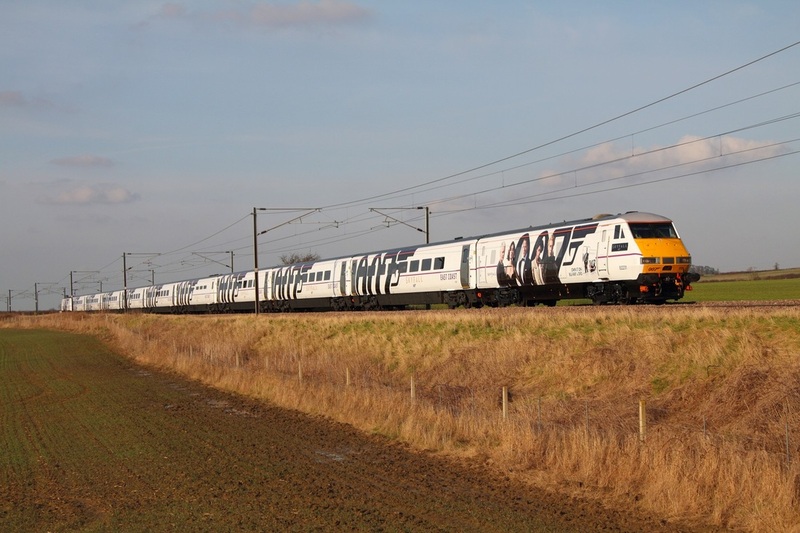 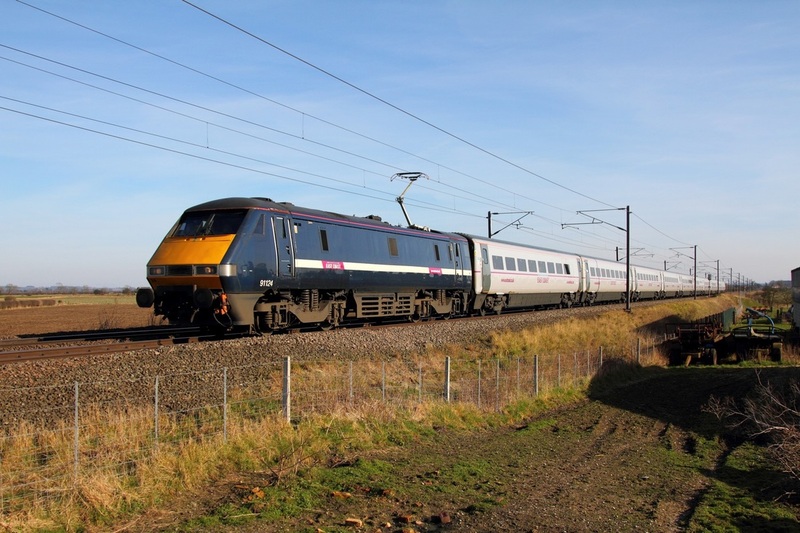 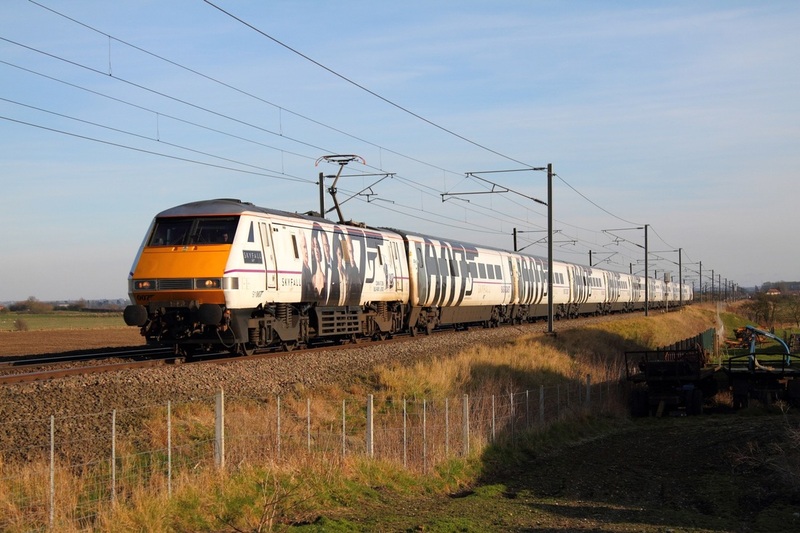 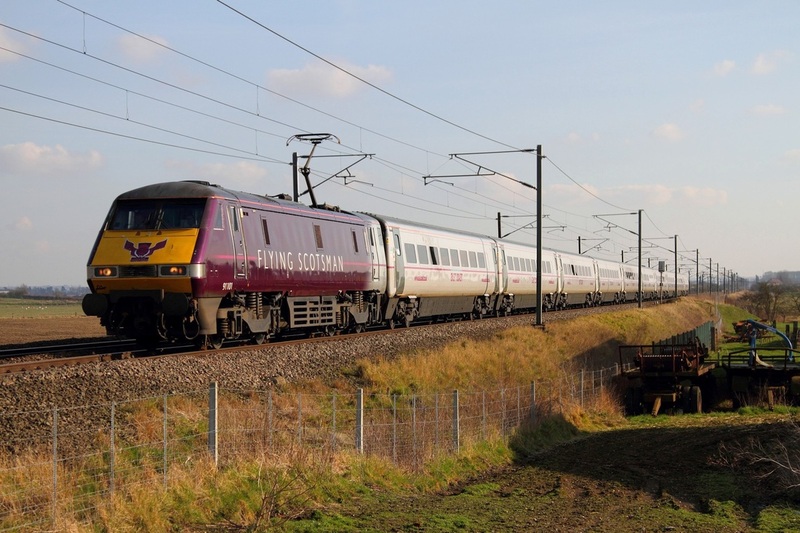 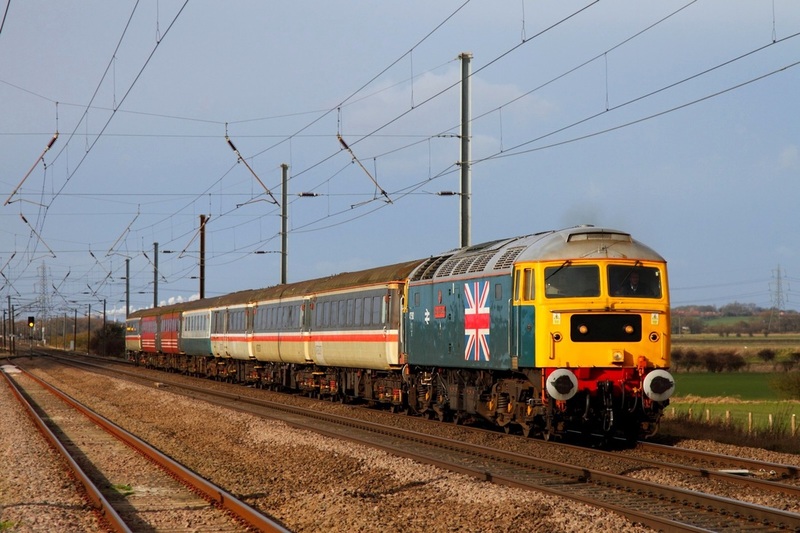 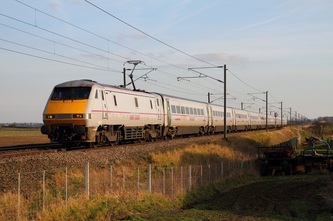 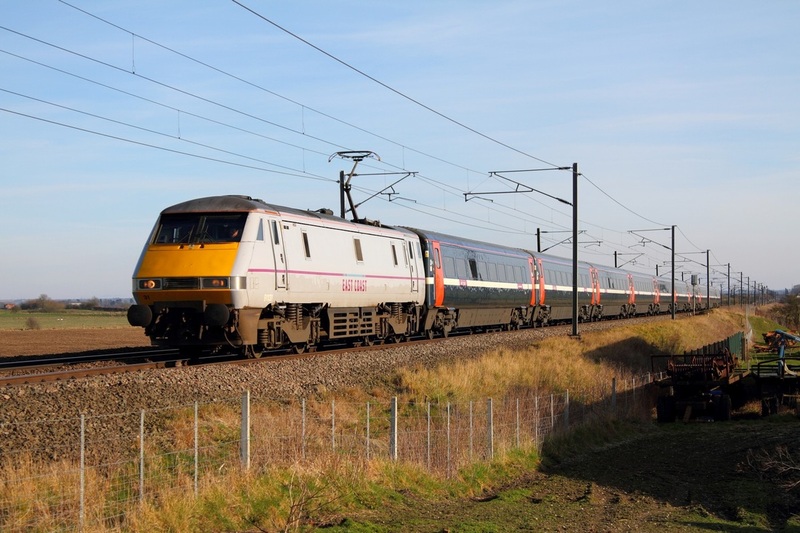 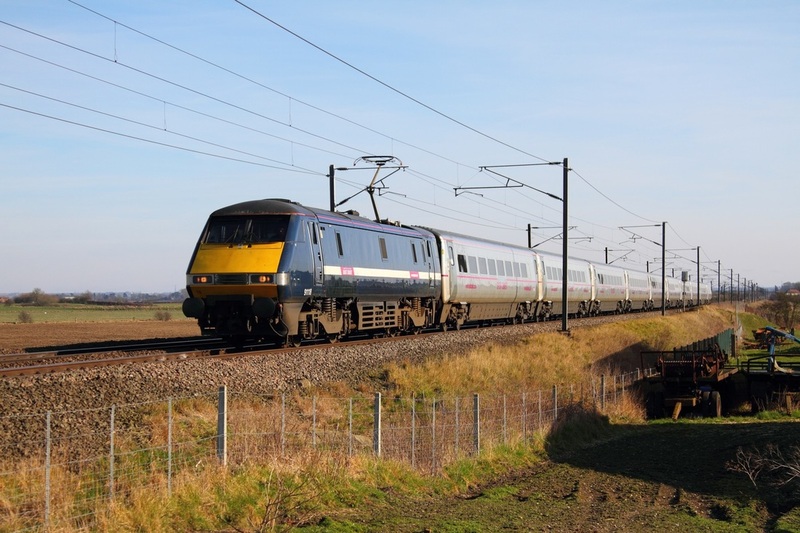 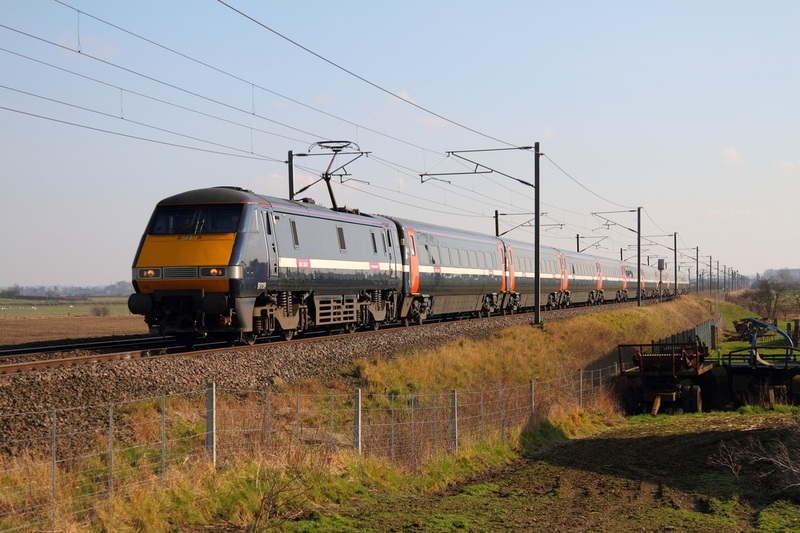 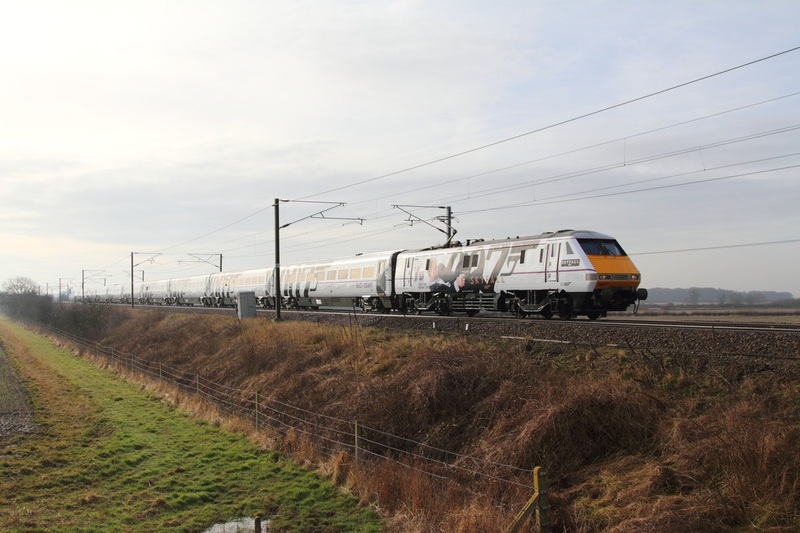 Battle of Britain 91110 leads the 1S17 London Kings Cross to Edinburgh East coast service at Claypole on the 17th February 2013. 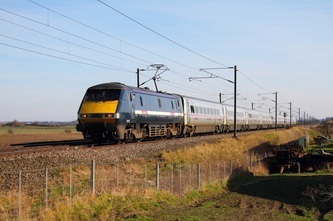 East Coast ex-GNER liveried 91119 leads an all blue rake at Claypole with the 1N16 Peterborough to Newcastle on the 17th February 2013. 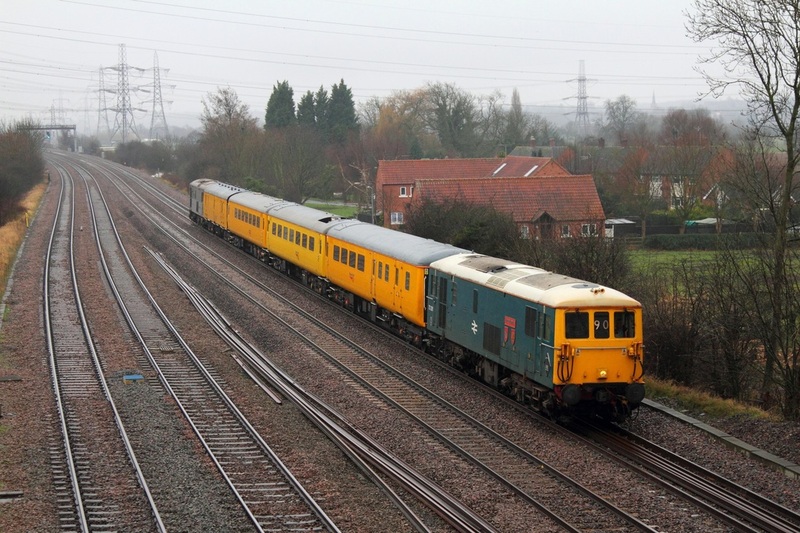 West Coast Railways 47237 leads 47760 on the 5Z55 Hitchin Up Yard to Carnforth Empty coaching stock at Claypole following yesterday's St Neots to Preston the "Lancastrian" charter on the 17th February 2013. Network Rail 57305 and 57306 worked an 0Z57 Tonbridge to Derby RTC positioning movement before the two yellow ronnies sandwiched Network Rail coach 977997 and worked a 1Z13 12:53 Derby RTC to Tonbridge test train, captured here at East Midlands Parkway, Ratcliffe running on the main with 57305 leading on the 16th February 2013. 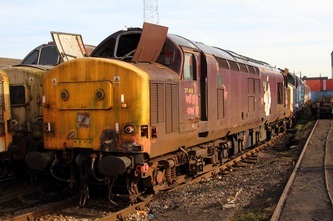 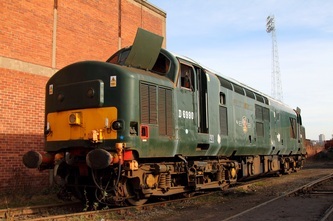 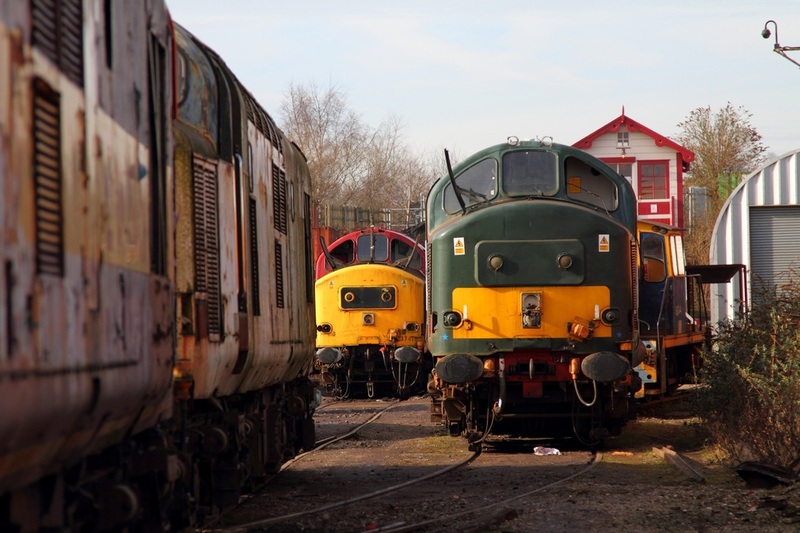 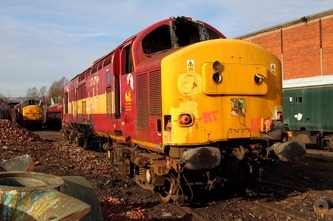 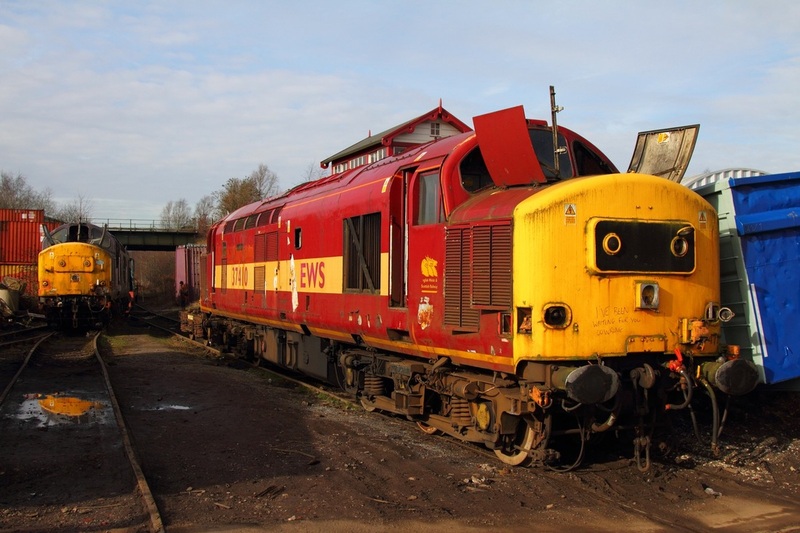 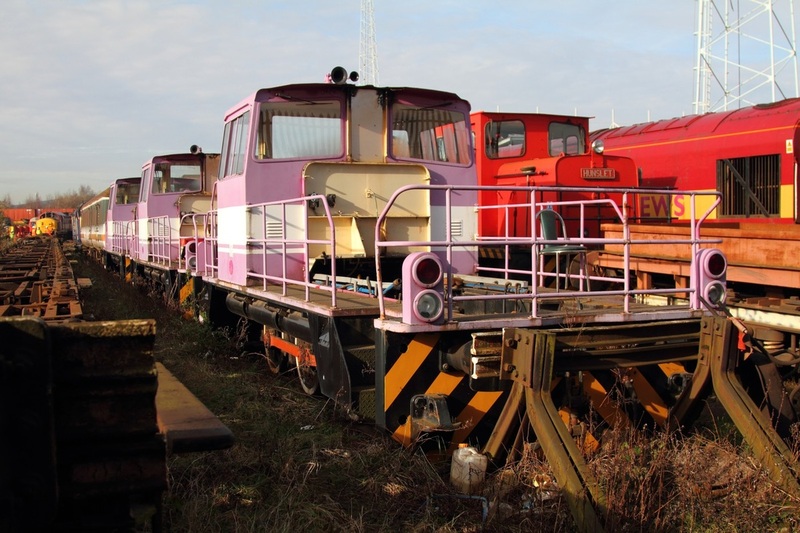 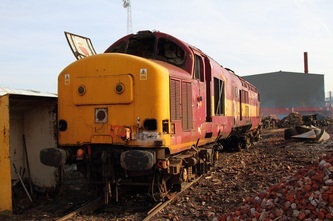 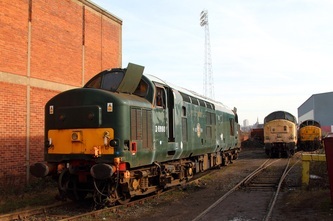 On the 16th February 2013, I went to CF Booths Rotherham Scrapyard. Several locos were in photographic positions. 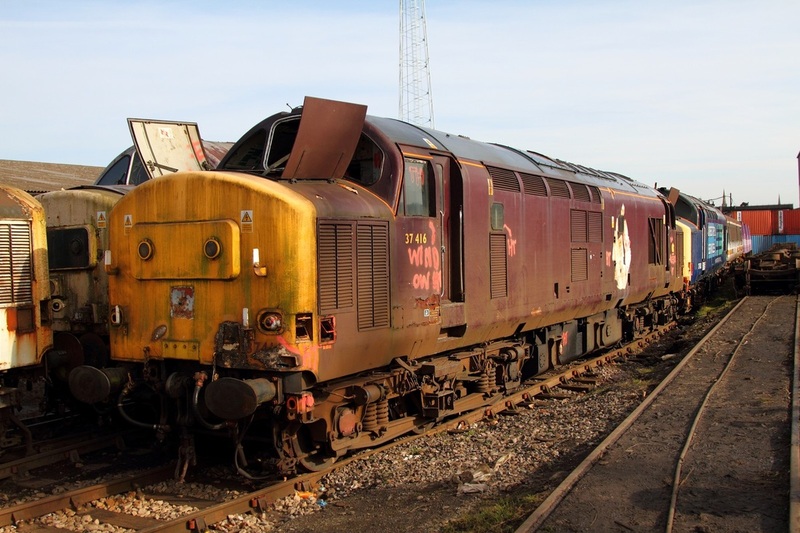 Locos in the scrapyard were 20306, 37087, 37406, 37410, 37411, 37415, 37416, 37417, 37426, 37428, 37683, 37696 and 47791. 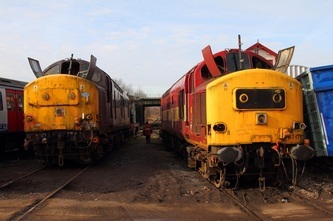 37411 and 37683 arrived this week from Derby RTC whilst 20306, 37087 and 47791 arrived from Barrow Hill. 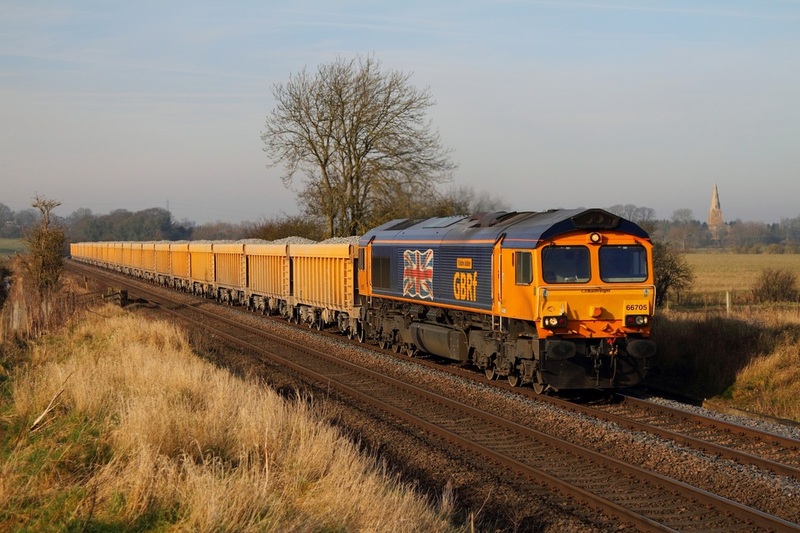 On the 14th February 2013, GBRf 66735 leads 20901, 20905, two barrier wagons, 20314 and 20096 on the 6M01 Peterborough to Derby Litchurch Lane at Loughborough. 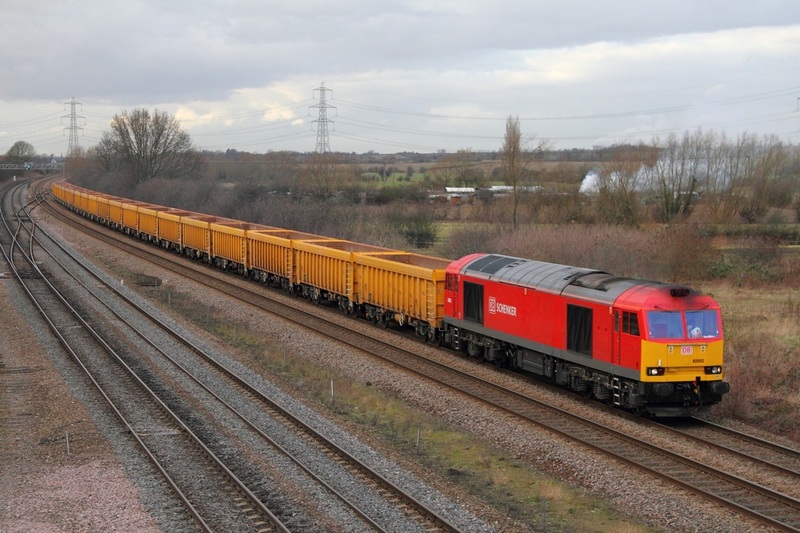 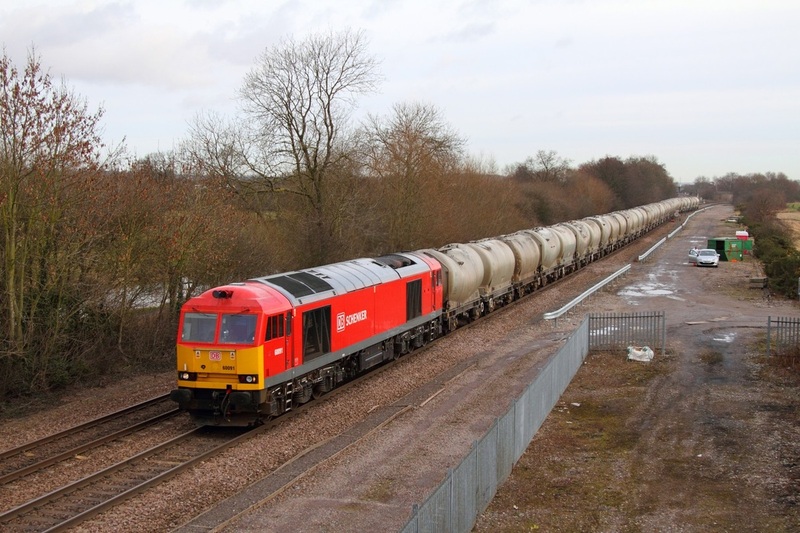 On the 14th February 2013, DB Schenker's 60092 hauls the 6M23 Doncaster to Mountsorrel at Loughborough. 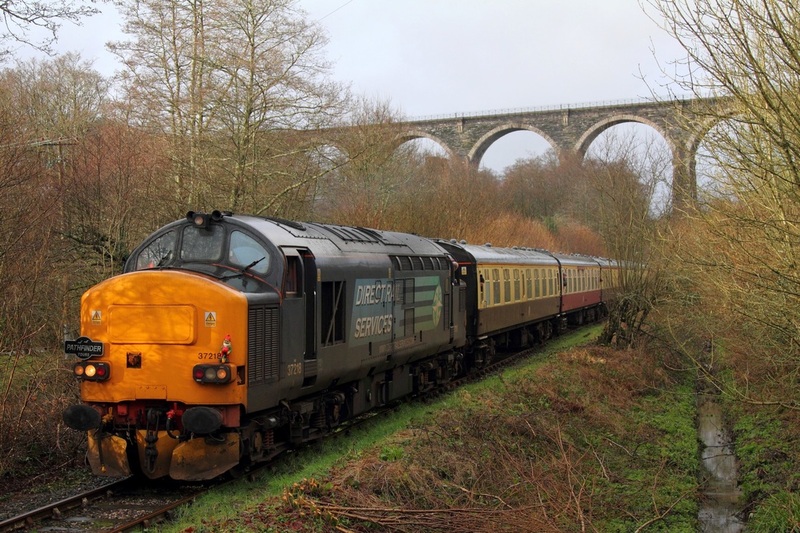 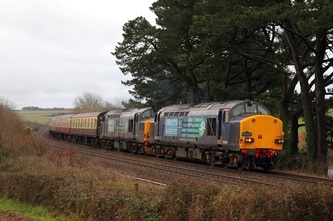 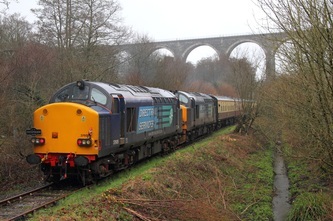 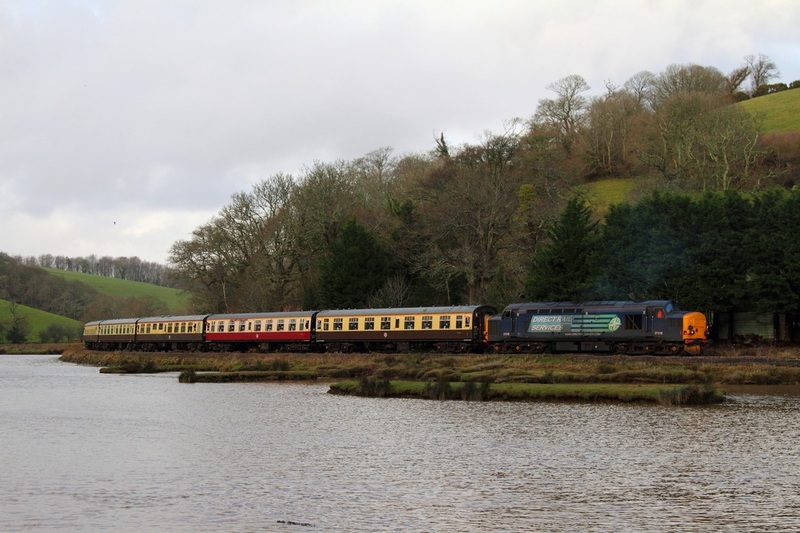 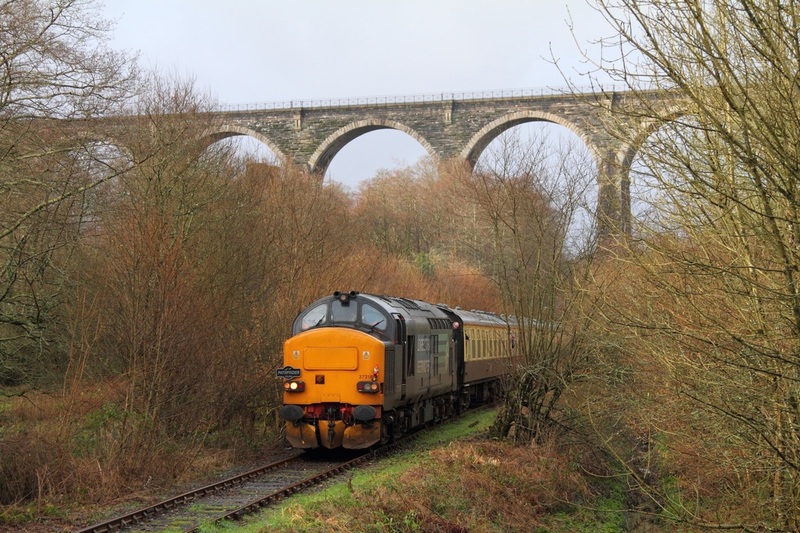 The Hullaba-Looe Pathfinder Railtour with DRS 37609, 37218 & 37608 visiting Exmouth, Moorswater and Looe on the 10th February 2013. 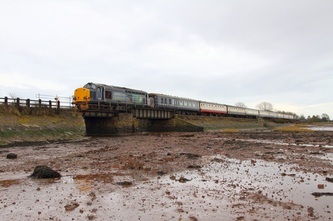 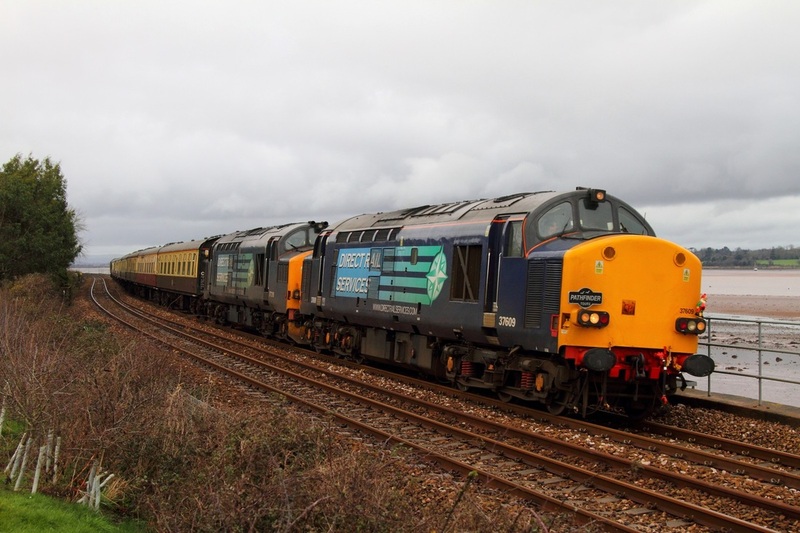 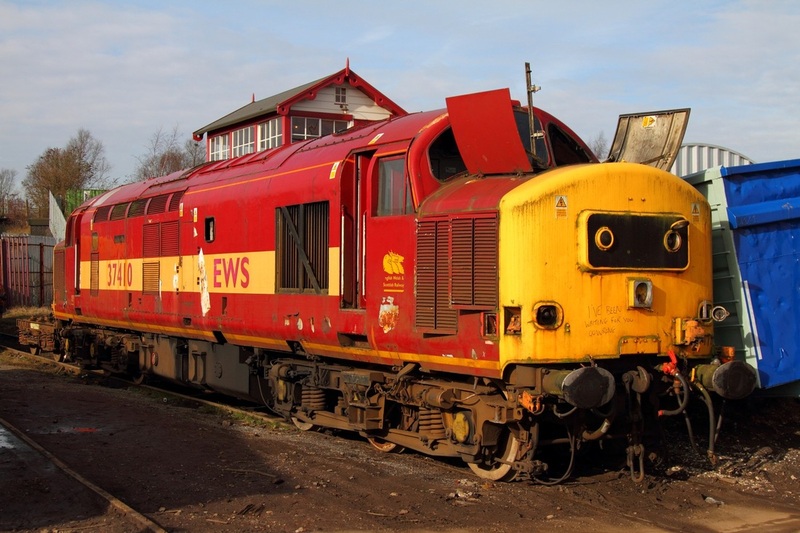 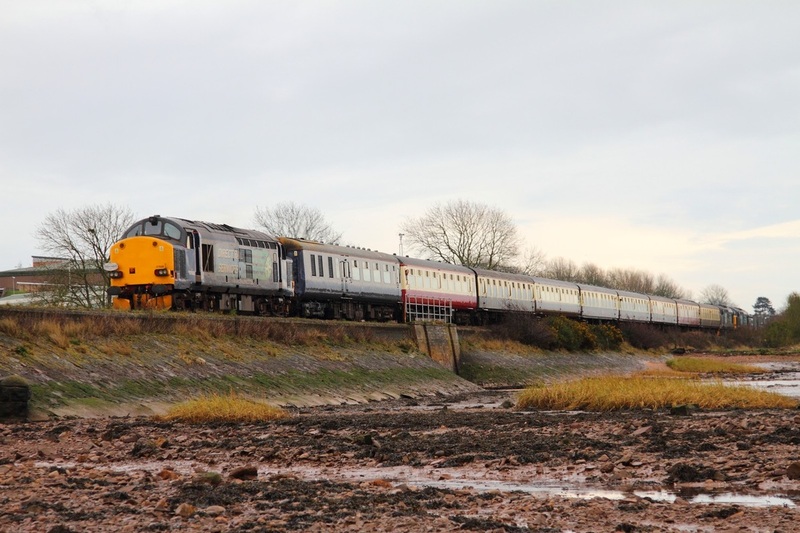 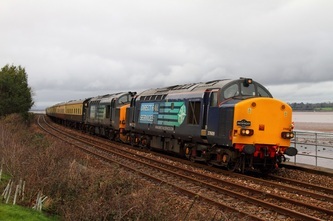 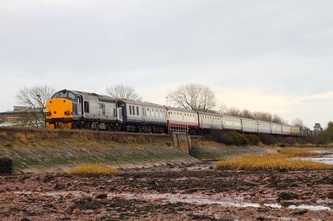 Collection includes 60010 working a rare engineers train in South Devon. 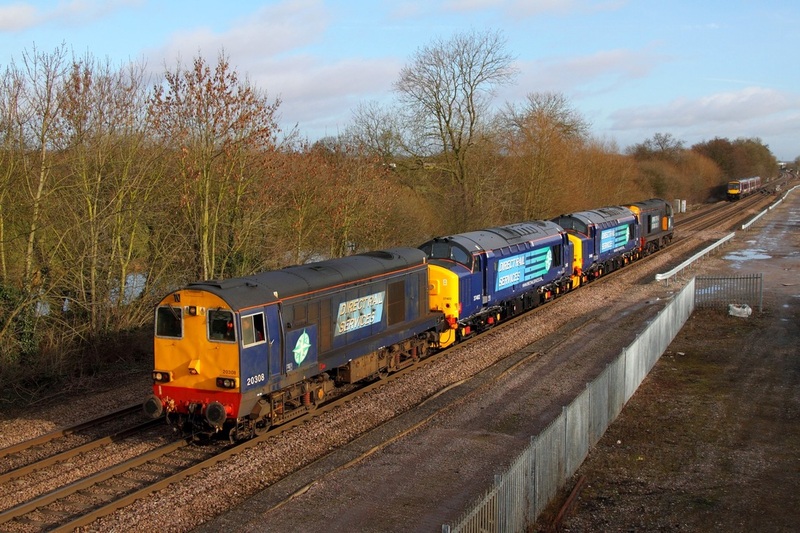 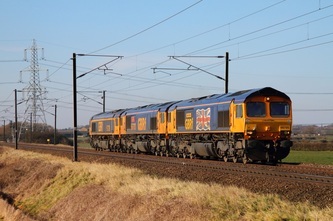 Freightliner Powerhaul liveried 86637 and 86622 are paired together on the 4M12 10:14 Tilbury to Crewe Basford Hall loaded freightliner at Ansty canal, north of Brinklow, Rugby on the 9th February 2013. 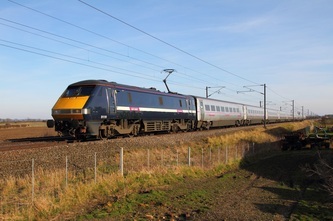 Br Blue 73201 'Broadlands' formerly 73142 leads Two Tone Grey liveried 73107 'Redhill 1884-1994' are captured on the Midland Mainline at Ratcliffe on Soar near East Midlands Parkway on the main, top-and-tailing the 1Q50 10:00 Ferme Park to Derby RTC test train consisting of 9523, 977983, 999550 and 6261 and running almost 100 minutes early on the 9th February 2013. 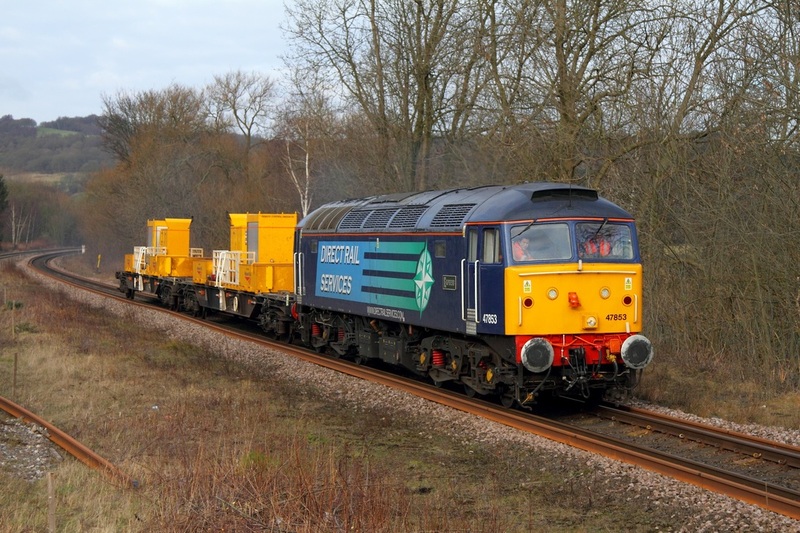 Former XP64 liveried 47853 'Rail Express' now owned by DRS and sporting the house colours worked light engine as 0Z26 York Parcels Sidings to Derby RTC on the 8th February 2013 to work the 6Z25 Derby RTC to Derby RTC via Ambergate, Chesterfield and Sheffield consisting of Snow wagons 7095940026 and 7095940042 before working as 0Z26 return to York Parcel Sidings (vice Crewe Gresty Bridge). 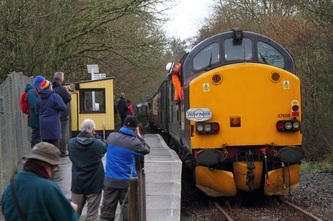 After departing over an hour late, the train returns with 47853 at the helm through Duffield station running 38 minutes late. 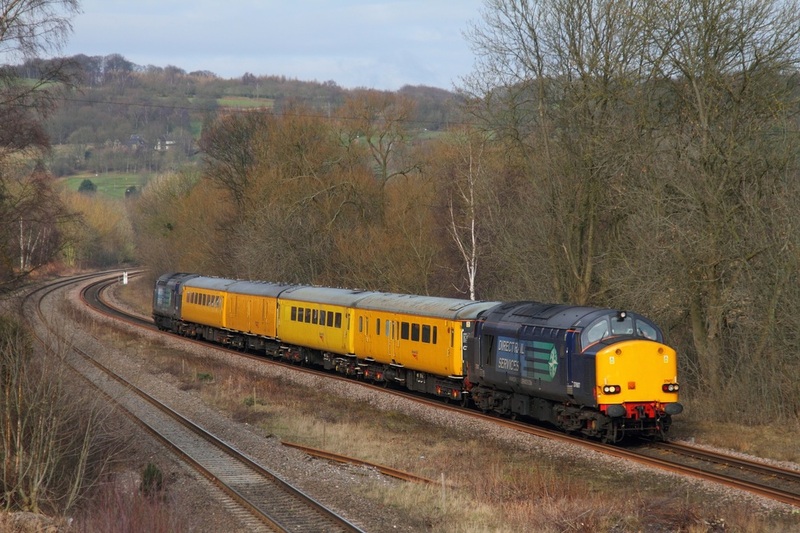 DRS 37667 works north through Duffield station powering the mighty 6Z37 Etruria to Doncaster Up Decoy on the 8th February 2013. The train had been looped just north of Derby for a while making the second shot here possible. 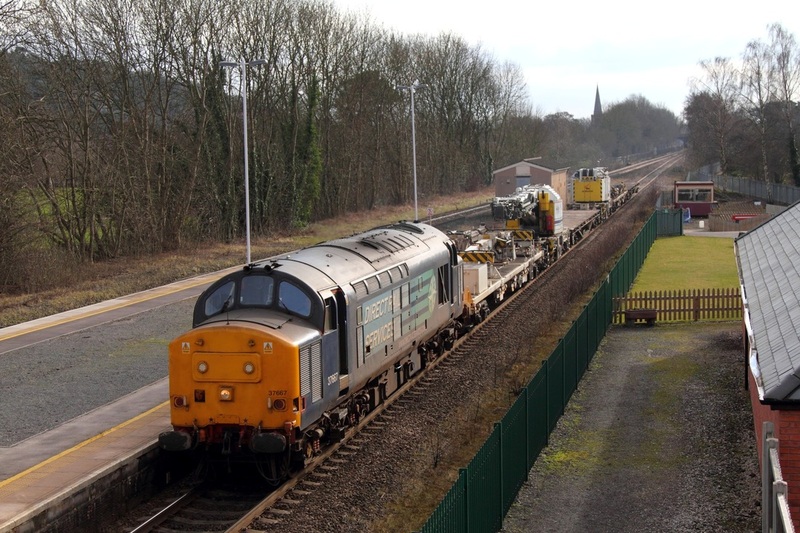 DRS 37607 and 37605 top and tail a 1Q13 York Holgate to Derby RTC test train at Duffield station on the 7th February 2013. 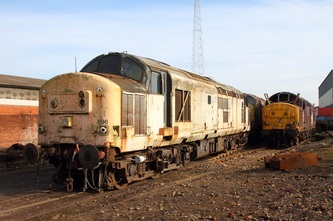 Both former Eurostar Growlers, 37605 was formerly 37507 and 37607 was formerly 37511. 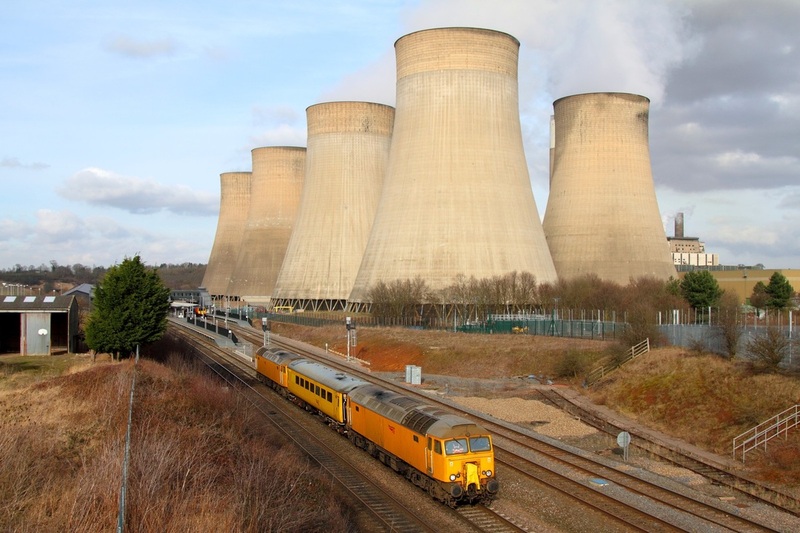 The backdrop consists of the five Willington Power station cooling towers the remnants of long-closed Willington Power station as DRS 37261 leads Northern Belle coach 3273 and DRS 47501 over the B5008 level crossing as the train powers away from North Staffs junction working as the 5Z30 Derby to Crewe CS on the 8th February 2013. A wider angle shot... DRS 37261 displaying the Northern Belle head-board hauls Northern Belle coach no. 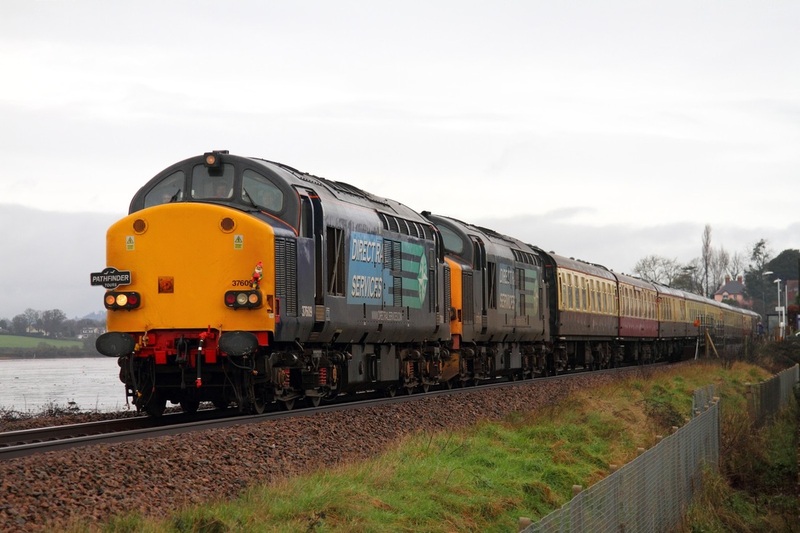 3273 sandwiched with DRS 47501 on the rear at Willington on the Uttoxeter line just west of North Staffs junction working as the 5Z30 Derby to Crewe CS on the 8th February 2013. 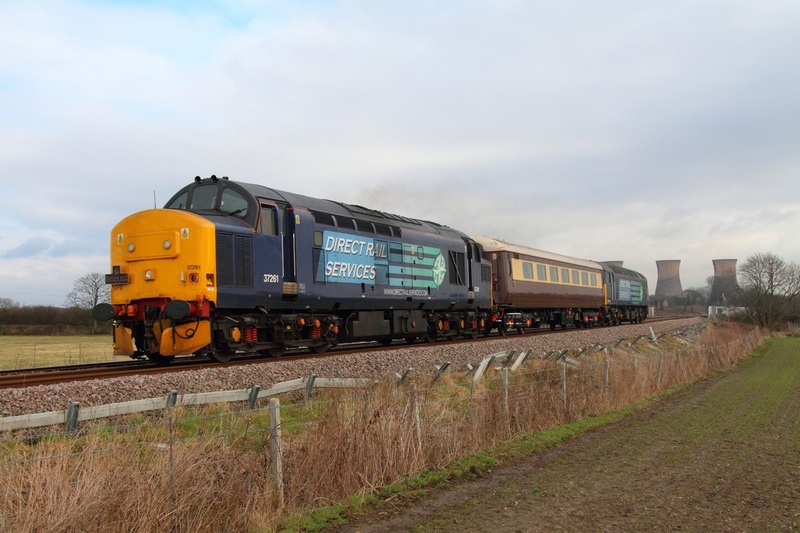 DRS 37667 hauls the 6Z37 Etruria to Doncaster Up Decoy engineers at Willington on the Uttoxeter line nearing North Staffs junction on the 8th February 2013 running about 25 minutes early. 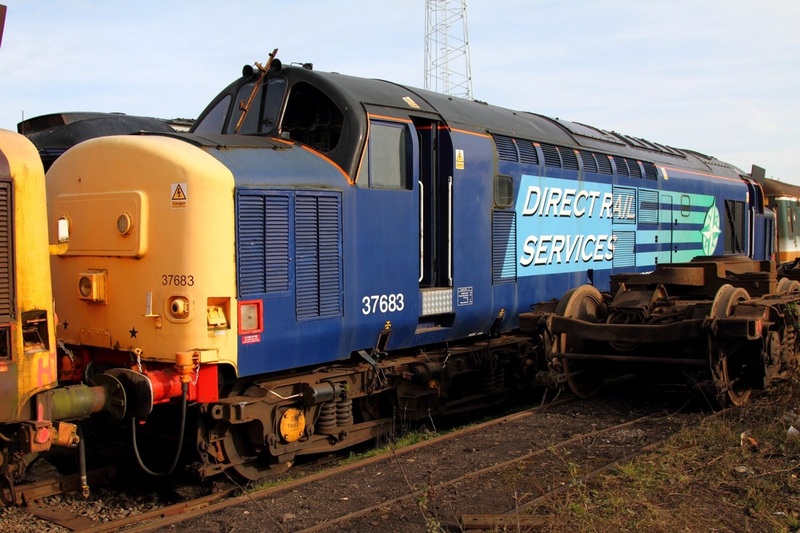 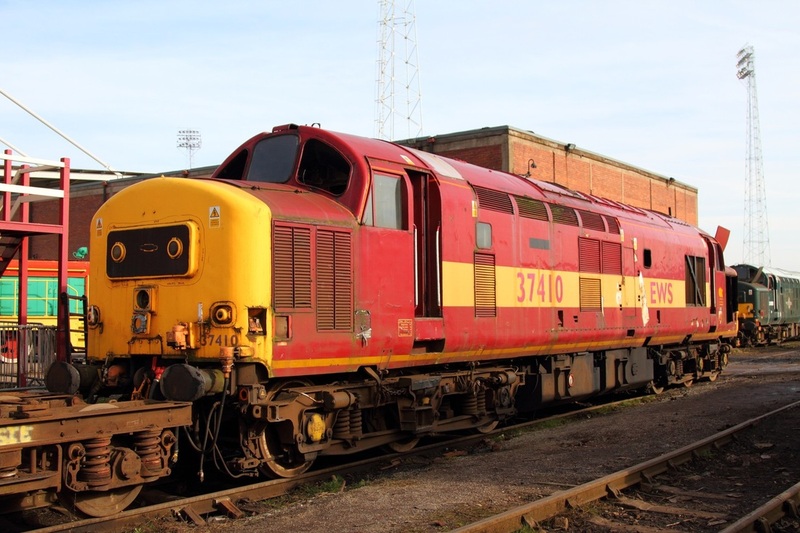 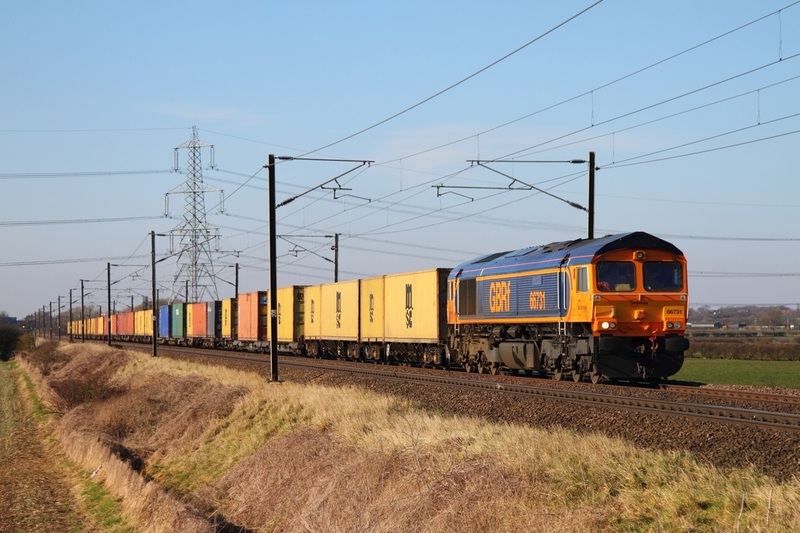 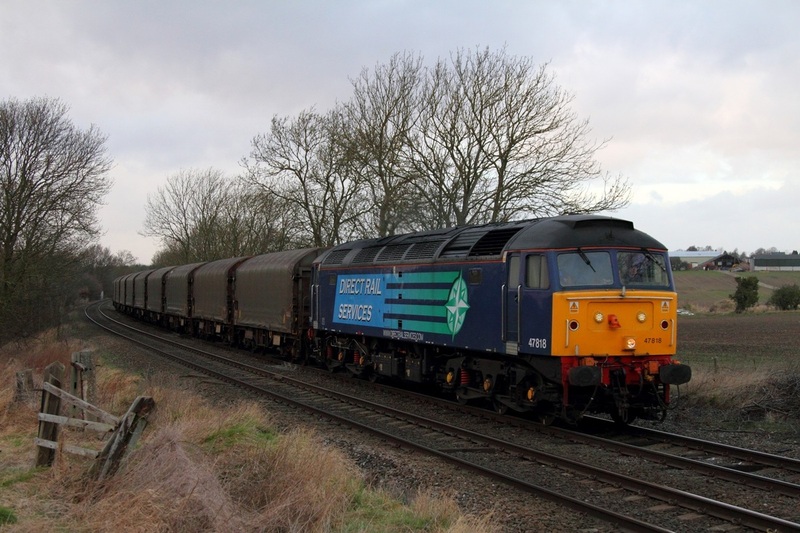 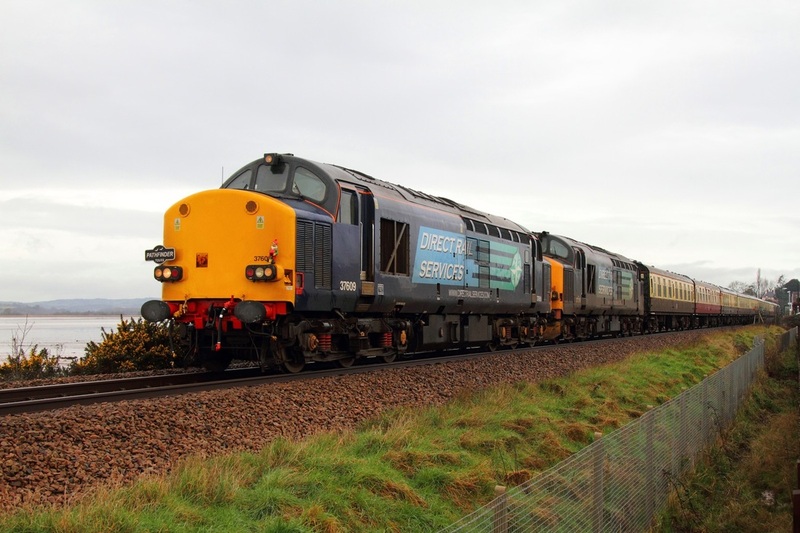 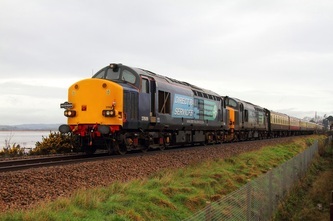 37409 had worked the 6Z38 Toton Up Yard to Etruria on the 5th February. 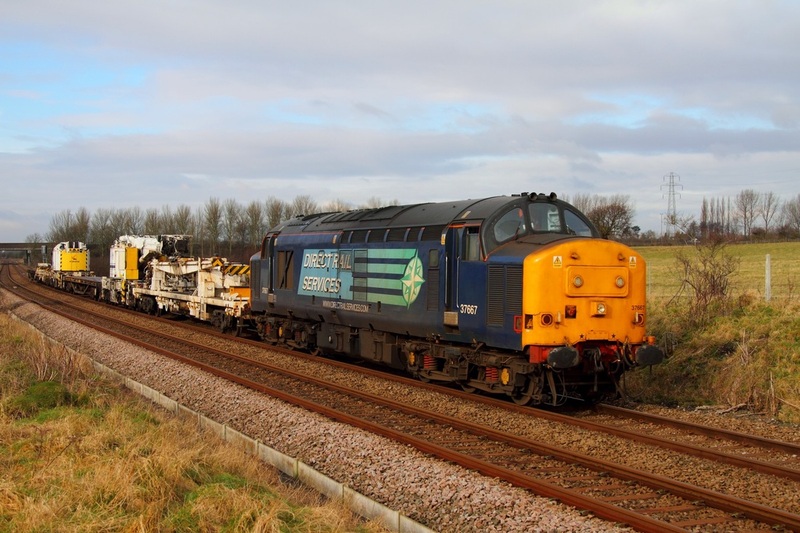 GBRf 66705 'Golden Jubilee' works the 6L28 Carlisle Yard to Whitemoor engineers at Syston on the Melton Mowbray line on the 7th February 2013. 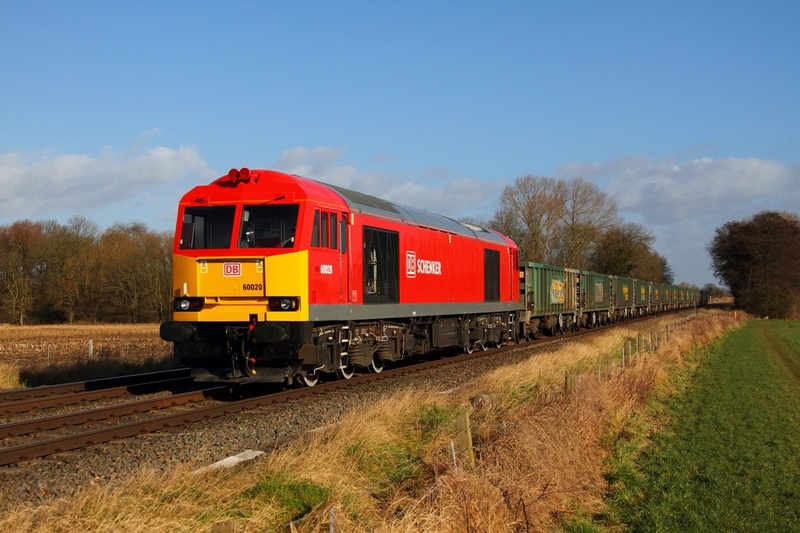 DB Schenker 60091 accelerates away from Stenson junction on the approach to North Staffs junction running just over half an hour late powering the 6Z65 Earles Sidings (Hope) to Walsall freight terminal cement train on the 7th February 2013. 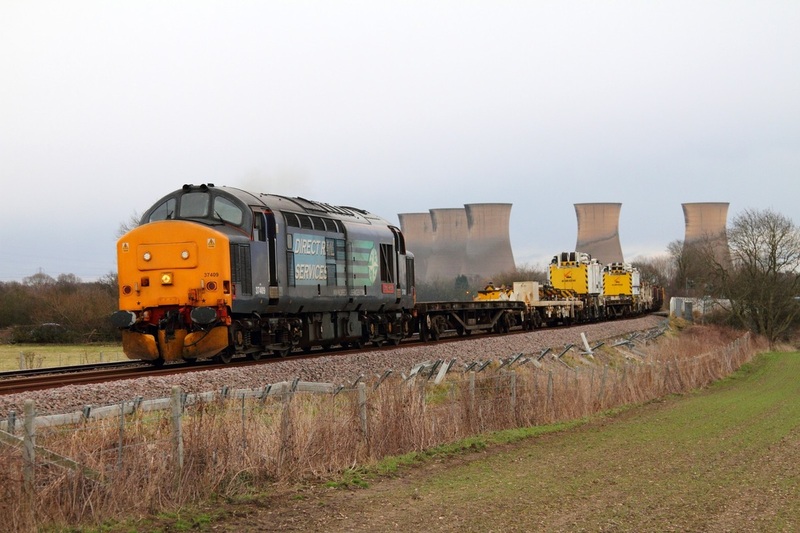 DRS 37409 'Lord Hinton' hauls the 6Z38 Toton Up sidings to Etruria engineers at Willington just west of North Staffs junction on the 5th February 2013. 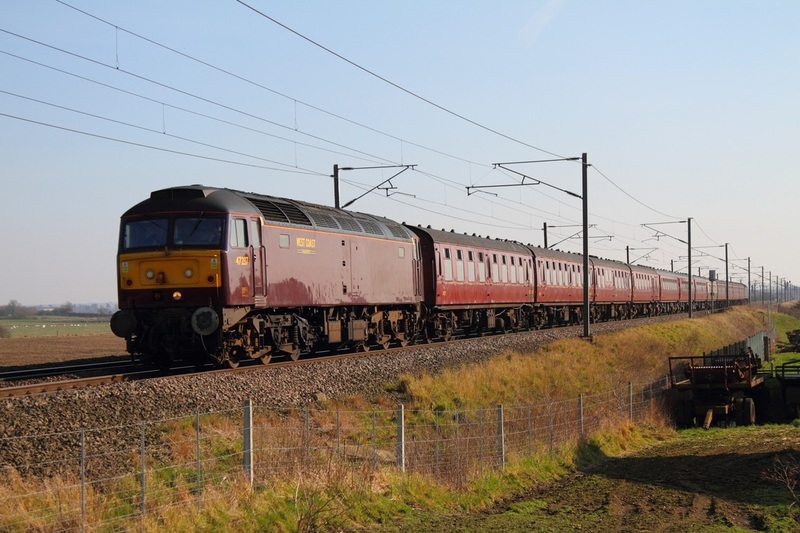 The Growler had worked light engine from Crewe Gresty Bridge to Toton Up sidings as 0Z37 the morning via Rugeley and Burton on Trent. Stratford 47 Group's 47580 sporting Br Blue livery with the Union Jack flag, looks stunning as she powers through Claypole (south of Newark) working the 5Z47 Wolsingham to Dereham (DCR operated) consisting of 3521, 5866, 5906, 5960, 6059, 6168 and 9497 on the 5th February 2013. 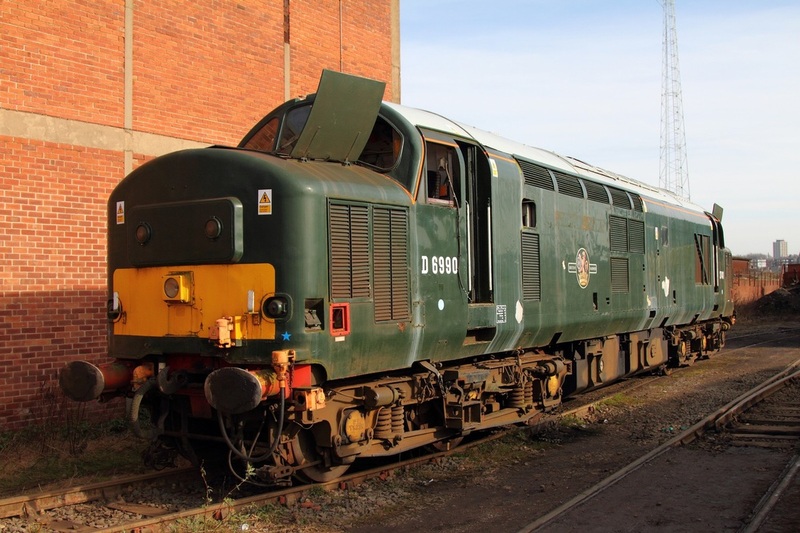 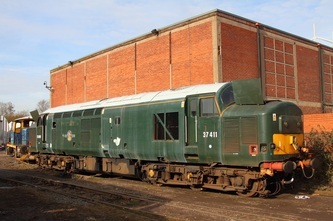 The Heritage class '47' will star alongside 47596, 47579, 37003 and 31235 at the Stratford Depot event on the Mid-Norfolk Railway (link) this coming weekend. 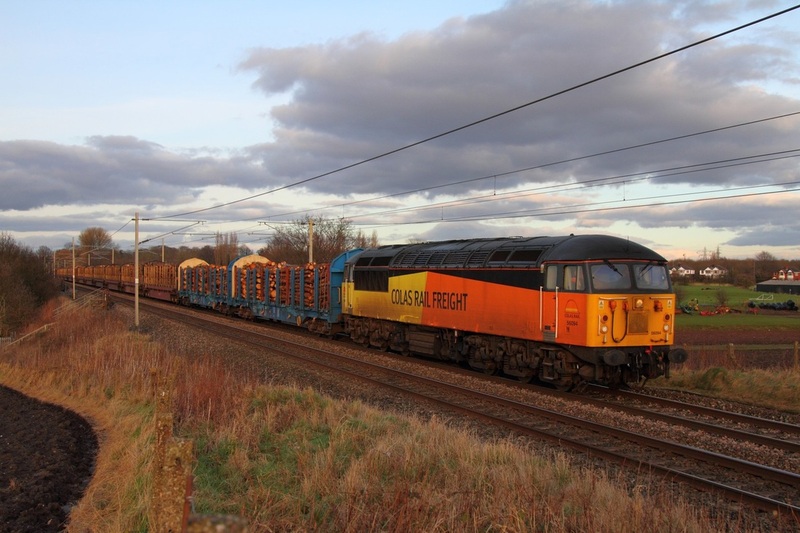 Colas Rail hire in 47818 from DRS to work the Boston Steel! 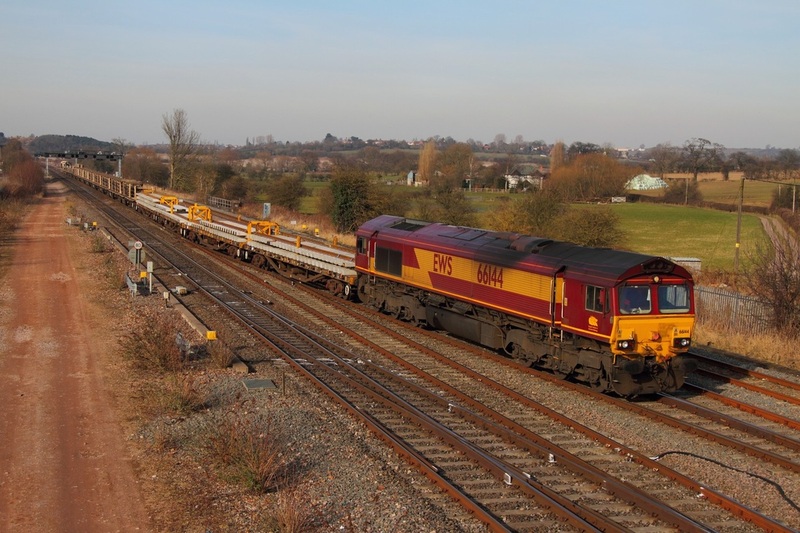 With 47727 working a 6Z36 Llanwern to Long Marston consisting of 37 VTG JSA wagons for storage, 47739 on an exam and with the use of 47749 currently restricted, corresponding with the unavailable 56302 and 56087 (both on exams) and 56094 on timber duties, Colas Rail opted to hire in 47818 from Direct Rail Services to work the afternoon's 6E07 Washwood Heath to Boston Docks and 6M08 steel train. 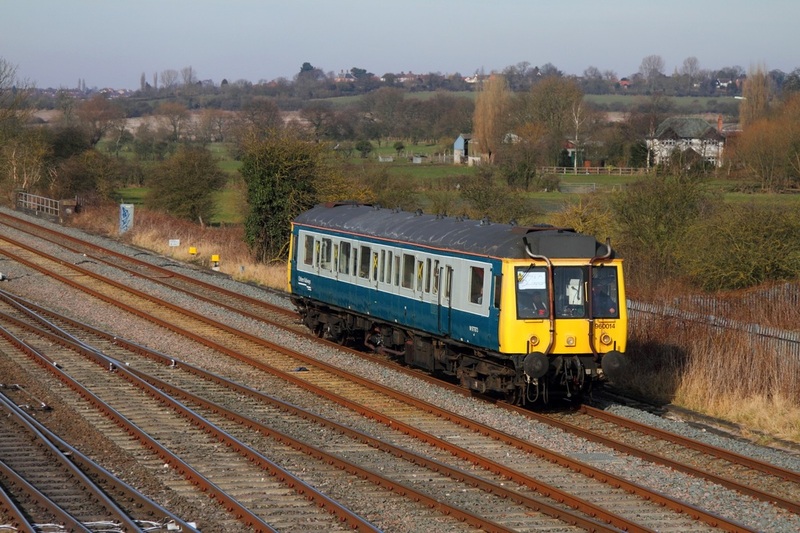 A DRS '47' makes a rare appearance on the train at Chellaston (east of Stenson junction) running roughly 30 minutes late with 6E07 on the 4th February 2013. 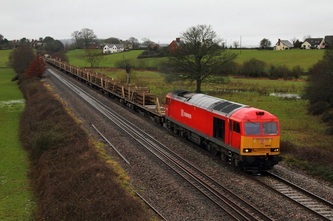 DB Schenker's 60020 - the most recent tug released into traffic following extensive overhaul and refurbishment (60039 to follow very soon after several test-runs) is captured approaching the level crossing at East Goscote on the Melton Mowbray line whilst working the usually class '66' dominated 6E14 Whitemoor Yard to Aldwarke consisting of loaded Freightliner heavy haul green boxes on the 4th February 2013. 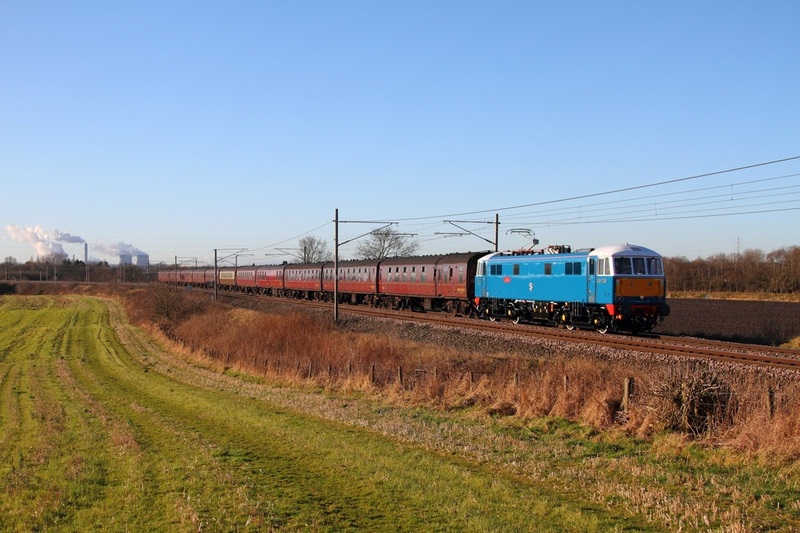 The loco would work light to Toton before returning to Whitemoor predictably on the 6L15 Toton to Whitemoor engineers and 6M15 return. 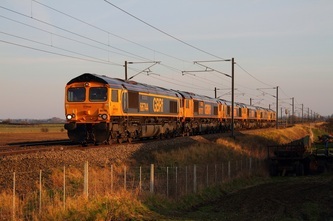 Colas Rail 56094 hauling the 6J37 Carlisle yard to Chirk loaded logs cruises through Red Bank south of Newton le Willows on the approach to Winwick junction on the 2nd February 2013. 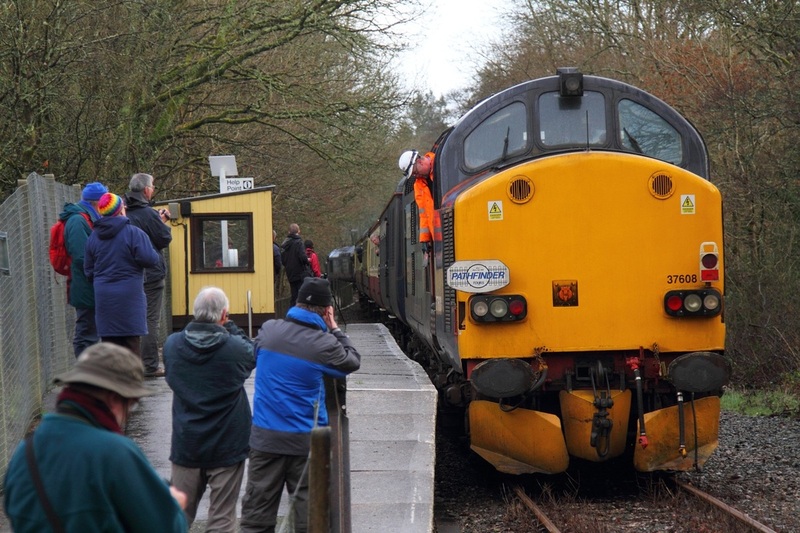 The train had been looped at Carnforth and was running bang on time when this shot was captured. 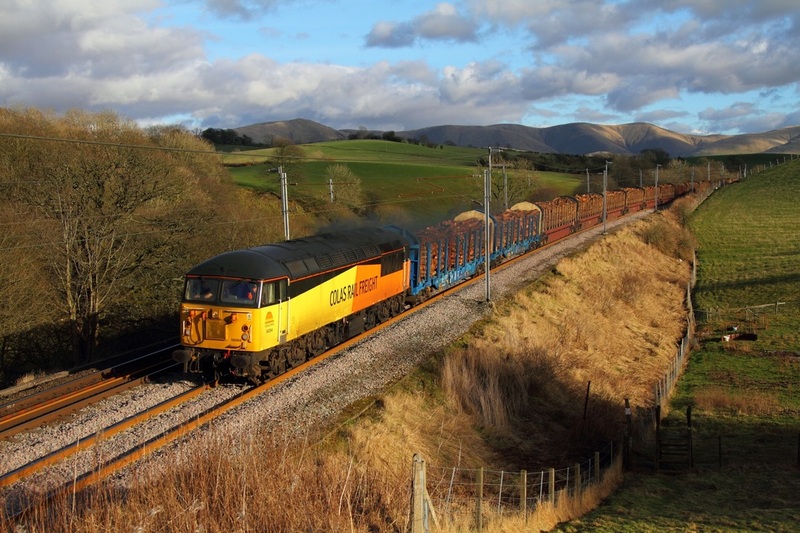 Colas Rail 56094 rounds the curve at Grayrigg near Docker whilst powering the mighty 6J37 12:40 Carlisle Yard to Chirk loaded timber wagons on the 2nd February 2013. The Grid had been held in Eden Valley and Shap loops which gave the opportunity for a second shot. Under an increasingly threatening sky, Colas Rail 56094 passes through Lowhouse near Plumpton working the 6J37 Carlisle yard to Chirk loaded timber on the 2nd February 2013. 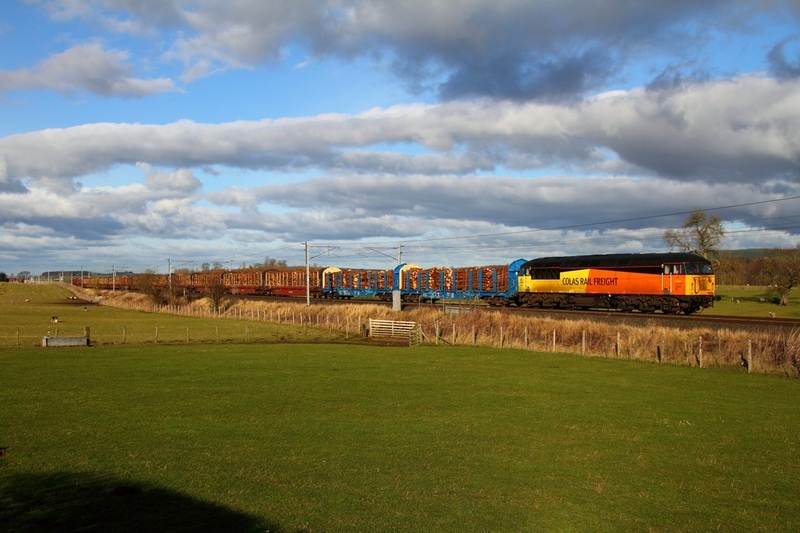 The timber train had departed its origin 21 minutes late but was making up good time as it was approached Penrith. 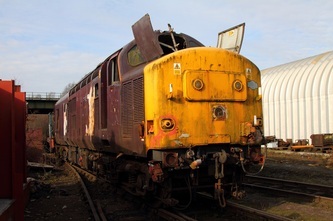 For January 2013 and previous images from 2012, please click here to go to latest news.